Here at Parkside, we’re studying Paul’s letter to the church in Ephesus. In chapter 2, he lays out what we are by nature – sinful, alienated from God, and unable to save ourselves. He then contrasts that with what we have become by grace – alive, raised, and seated with Christ. Both Paul’s direct approach and concise message offer a good model to follow when introducing others to Jesus. Let me encourage you to read the passage. 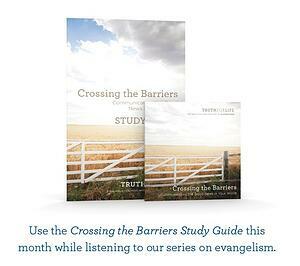 I mention this because this month our series, Crossing the Barriers, is a topical study on evangelism. We’re called by Jesus to “Go into all the world and proclaim the gospel…” (Mark 16:15) and that endeavor is challenging. Striking up a conversation about Christ with friends, neighbors, and colleagues is an intimidating prospect. The Crossing the Barriers series seeks to provide step-by-step help for approaching these discussions so I hope you’ll have an opportunity to listen. A good way to talk to others about Jesus is the way a beggar tells another beggar where to find bread. Patience and compassion should mark our presentation of the Gospel. It’s important to keep in mind that we were once dead in our trespasses and sins and have no basis for boasting. It is only because of God’s love and great mercy that we are made alive in Christ – saved by grace. Paul writes, “For by grace you have been saved through faith. And this is not your own doing; it is the gift of God” (Eph. 2:8). Keeping this forefront in our minds enables us to approach the task of evangelism with the proper sense of humility. It’s also important to understand that our part is to share the Gospel with clarity and conviction and God’s part is to open blind eyes and soften hard hearts. “Evangelism is man’s work, but the giving of the faith is God’s” (J.I. Packer). A good rule of thumb is to pray, rely on the Holy Spirit to guide the discussion, and then pray more. This Crossing the Barriers series comes with a comprehensive study guide. It’s very useful in a group setting but can also be completed individually. We’re also making available a resource that will provide further help. My long-time friend Derek Prime wrote a concise (only 60 pages) book (This Way to Life: Discovering Life to the Full) that explains the essential facts of Christianity. It’s a wonderfully compelling overview to share with those questioning these things. I hope you take advantage of these offers. P.S. The Crossing the Barriers study guide will be accessible all month online. Additionally, you can order the guide as a pre-printed booklet at our cost, with no mark up.